I love my long hair. I love that I can throw it back in a pony tail before a workout, I can squish it into a bun, or I can wear it down with some natural wave. I have very thick hair, but the strands are fine, so I’m more likely get dry split ends. My hair is also naturally curly, so I damage it every time I run it through a blow dryer or hair straightener. And don’t even get me started on what the summer does to my hair! 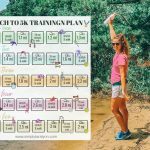 There are a lot of ways you can keep your hair long and healthy, and I am going to share them with you! 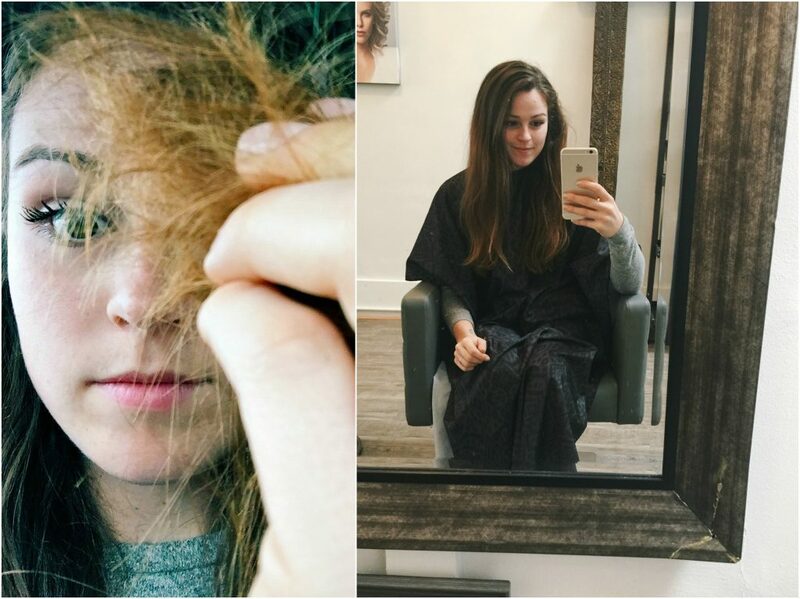 If growing your hair long isn’t your goal, but healthy hair is, I have tips for you too! I recently discovered Pura D’or (pure uh dee or) about month ago and my hair has never been the same. 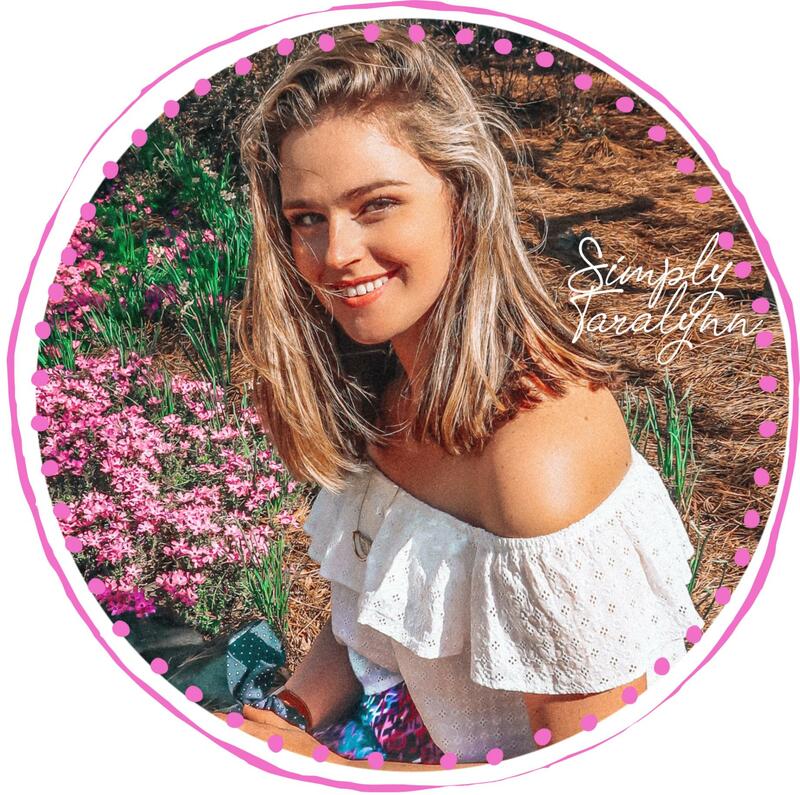 I have been using their gold line shampoo and conditioner every other day and it has already helped me with growth, reduced hair thinning, and moisture. I’m always hesitant when it comes to hair products because I felt like nothing ever worked for my hair, but Pura D’or had over 13k + reviews, so I had to give it a try. Even though hair products are incredibly important, there are a couple other factors in keeping your hair healthy! 1. Frequent trims- I get my hair trimmed every month. I take about one inch off. 2. Goodbye layers (for now)- I wanted my hair to be really healthy. I decided to get it cut one length, and keep it trimmed for an entire year before putting layers into it. Why? The less layers, the less split ends. You can get rid of your split ends a lot faster when your hair is one length. 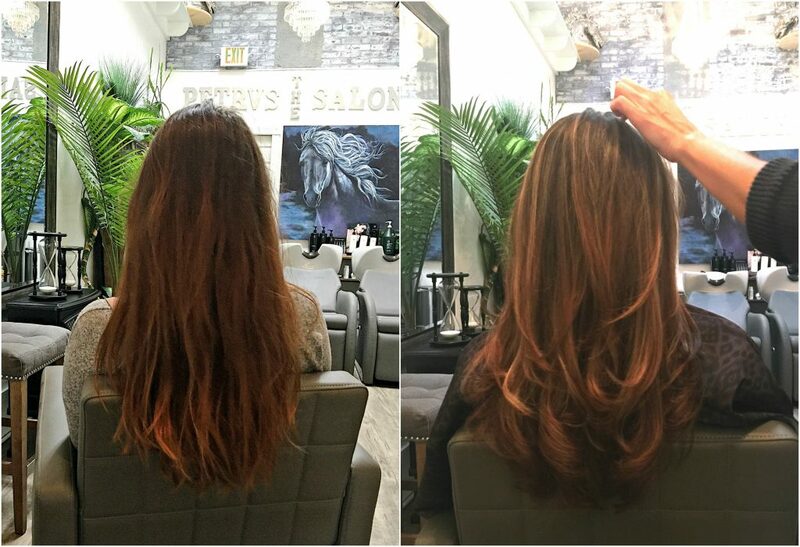 If you get your hair trimmed with layers, your upper layers will still be split. Try to keep it one length for a while. This does not have to be permanent! 3. Diet- Vitamins play a huge role in healthy hair. Try to eat foods rich in vitamin C and vitamin B. 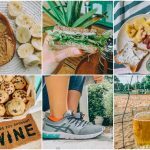 Some of my favorites are salmon, almonds, avocados, eggs, and sweet potatoes. Protein and iron are also important for healthy hair. Try eating kale, spinach, or steak. 4. Protect Your Hair- I learned my lesson last year. I never put any sun protectant on my hair before laying out by the pool, running, or being outside. My hair was definitely kissed by the sun, and that is why I turned into a redhead. The sun and chlorine from the pool can damage your hair tremendously. Never ever leave chlorine in your hair! Wash it right after you leave the pool. This goes for saltwater too, the salt can dry out your hair. 5. Stop washing your hair everyday– Hair does not need to be washed everyday. You can put your hair through a lot of stress by overdoing it. Washing your hair everyday causes more split ends, drys your hair out, and it starts to lose it’s natural character. Try using dry shampoo every other day. 6. Stop overheating it – I straighten or blow dry my hair maybe once every couple of months. I love to let it dry naturally as much as possible. I know it’s hard for a lot of people to do that because of timing, but try to limit heat and styling. There are a lot of hairstyles you can do without heat. Try buns, overnight rollers, braiding, or hair clips to give it style. Blow drying and straightening is another way to dry out your hair, damage it, and break all the pieces. 7. Don’t brush wet hair. I had no idea I was damaging my hair while brushing it in the shower. I thought it was the only way I could get a brush through it, but when your hair is wet, it stretches and breaks off causing more split ends. Wait until your hair is dry, or brush it softly. You can get a wet-brush designed for brushing wet hair. 8. Condition- Try to give yourself at-home conditioner treatments once a week. I like to massage Argan oil into my scalp and the ends of my hair. I leave it on overnight, or while I’m working from home. 9. Don’t overdue the dyes- It’s ok to get you hair colored and lightened up, but pay attention to the products you’re using. Most of the box dyes have damaging chemicals. Talk with your hair stylist about more natural and healthier ways to color your hair. The more you dye your hair, the more stress you’ll put it through. If you are going to dye it, make sure to condition it frequently. 10. 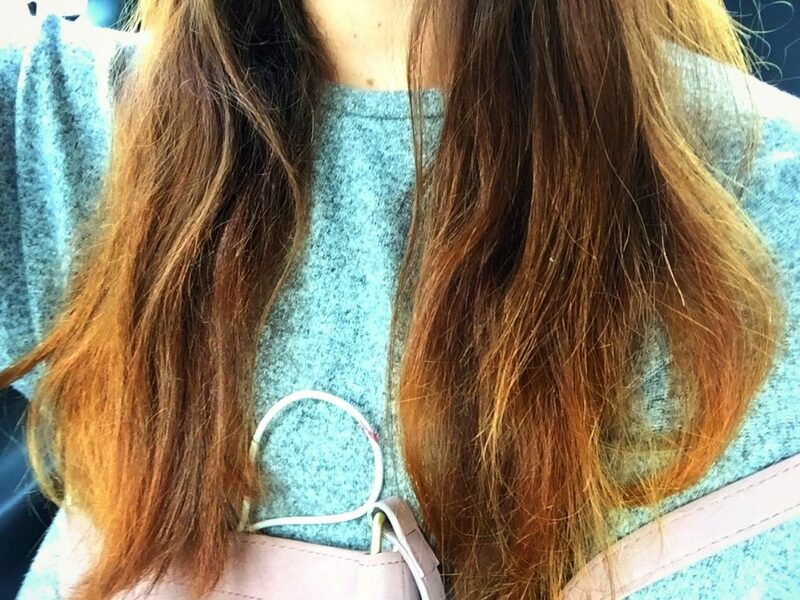 Be careful with hair ties– I couldn’t figure out why my hair was splitting when I wasn’t dying it or styling it. When I was working out, my hair would be in a tight ponytail on the top of my head. I had no idea that my ponytail was the culprit of split ends. Try to keep your hair in lower and loose ponytails. You can also buy the ribbon ties to prevent damaging. My hair stylist told me that product is everything for keeping your hair healthy. After using Pura D’or for a month, I 100% agree. My hair felt thicker, smooth, and I could actually get a brush through it. My favorite part about Pura D’or is the cooling sensation on my scalp while massaging. I spend three minutes massaging the shampoo into my scalp and then I let the conditioner sit in my hair for five minutes. The scalp is the root of the problem for hair thinning, so you have to start there! 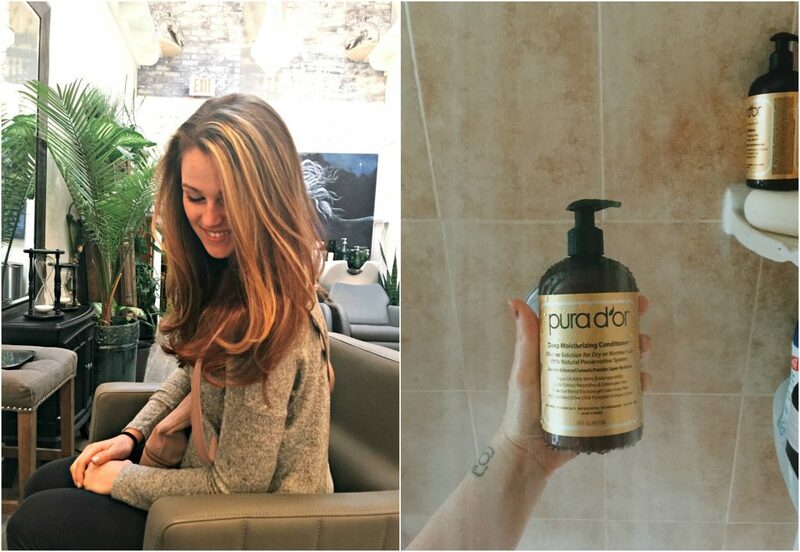 The Pura D’or fortifies and energizes hair from root to ends and it really helps with thinning of the hair. 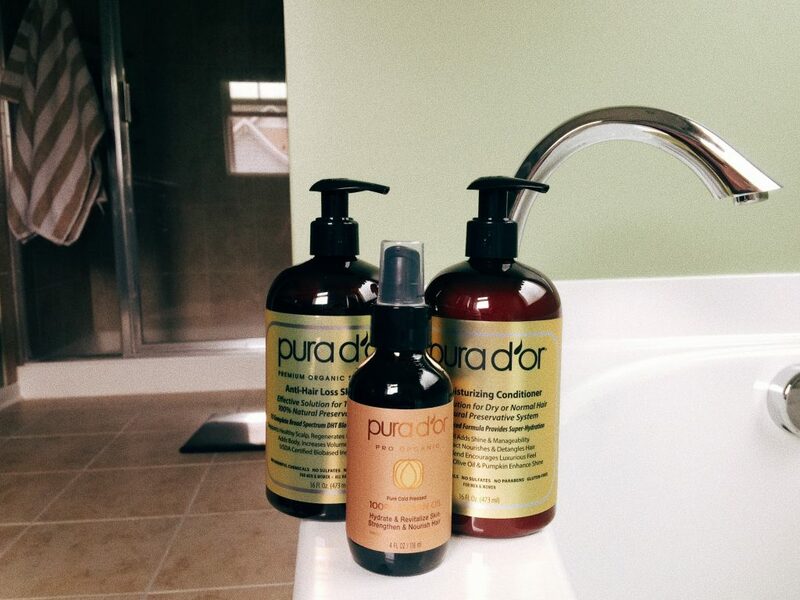 You won’t find any of the nasty chemicals in Pura D’or and I love that. 9 our of every 10 users noticed change and improvement. Their hair was full of volume after eight weeks. You can read more reviews on 2MinuteClub.com + they have the lowest member only pricing and free shipping. After my hair was finally long and thick enough, I decided to get layers and lighten it up a bit. I was going to do a full dye, but I’m trying to embrace my new red look. My hair looks SO MUCH healthier than it did a couple months ago and I’m loving how thick and healthy it looks. 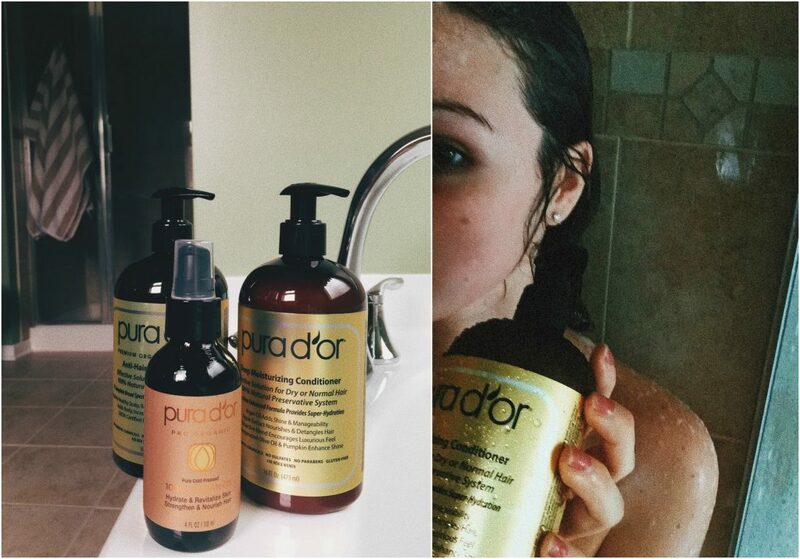 I can’t wait to see what my hair looks like after using Pura D’or all summer. Describe you hair in one word! Offer valid only on the shampoo/conditioner sets. This post was sponsored by Pura D’or and all opinions are my own! my hair has a split ends too.. what should I do to prevent it? Just ordered this! Can’t wait to try it. My hair is extremely dry from bleaching it over a year ago. I haven’t been able to get it to grow long like I want because it breaks. What kind of dry shampoo do you use? My hair gets so oily, I am scared to not wash it everyday. I really love the color you ended up with and I kinda want to copy it 🙂 What did you tell your hairdresser to do? Is it caramel highlights? Face framing? Your new hair looks awesome! Unpredictable. That would describe my hair! Thanks for the code! Can’t wait to try it out. I have always thought your hair was lovely, so thank you for sharing your tips with us. I struggle hard with split ends:( I wish I took care of my hair better! Does this stuff contain gluten? Have you ever done the egg and mayo trick on your hair? YES!!! My mom used to do it to my hair when I was younger! THE SMELL WAS AWFUL!!! Just purchased! Can’t wait to give it a shot. I quit using shampoo and conditioner in 2017! I haven’t used shampoo and conditioner since December 31, 2016! I’ve been using baking soda + water to wash my hair, and apple cider vinegar + water as a conditioning rinse. Right now I’m only “washing” my hair once a week, and using only water the other days. My hair has been greasier than normal (obviously), but if I keep it up, after a couple months my hair will hopefully stabilize after being stripped by shampoo for so long and won’t get greasy. I’m going to look into using essential oils for conditioning soon too! Oh wow! That is straight up dedication right there. So interesting please keep me updated!!! Ive heard of people doing this for years. Does the apple cider vinegar give your hair a weird smell at all? Ive been using Pura for months! I love it! Hi! Even with working out you’re able to wash it every other day? I work out almost every day as well, and my hair is very thick and curly. I wish I could go every other day with washing it and using a dry shampoo. But if I don’t wash it daily, it’s a giant frizz ball!! I’m excited to try this shampoo/conditioner set. I’m nervous to sign up for subscriptions, but I trust your opinion! I didn’t look too much into it yet, but are you able to cancel at any time just in case? Thanks for the insight on the new products! As always, your blog is wonderful! You can totally cancel at any time. Hi Jen H.! Yes the curling iron will do a lot of damage to your hair! Try to limit it and use cold rollers at night! I somethings braid my hair before bed. Let me know how you like it! So funny you blogged about this! I have been wondering about it! Because of this post and the comments I just ordered this shampoo & conditioner!! I’ll keep you posted on if I like it or not! My hair could use some SERIOUS moisture. Please let me know what you think! I’m in love. I live on the gulf coast and the humidity is horrible. I’m am attempting to give up on using heat bc it is wasted as soon as I step outside! I know how that is! I literally don’t even fight my hair in the summer here in North Carolina! Question: do you go to bed with wet hair or air dry it completely after washing? Do you use any other products to pump up the waviness? I usually do my hair mid morning and let it dry out all day or i’ll do it around 7pm. I have gone to bed with wet hair and I kind of love how soft and curly it gets, but I don’t worry too much on the timing, unless I have somewhere to be. I usually plan my showers way ahead of time! I don’t use any products other than a little argan oil at the ends. WE have the same type of hair and it’s nice to see someone actually seeing results from a product. I am scared to break my bank with different products and end up with the same result. I will add this to my wishlist and see what happens. Your new hair style is amazing. My hair in one word is curly. I have been putting 2tbsp of warm organic coconut oil in my hair once a week and leaving it in for 1-2 hours, has helped my hair grow , given my hair a natural glow and has taken the frizz out of my super curly hair, no more straightening!! Thanks so much! :) Yes coconut oil is great for hair! How do you get your hair to grow so fast?? I trim an inch off my hair every three months. I have thick, curly hair. It can be a sight to behold sometimes lol. But I keep it healthy with the right products (I love Not Your Mother’s products) and only heat styling it straight twice a week during the cold months. I think diet is everything and the healthier your hair is, the longer it actually looks. I definitely don’t heat my hair twice a week, more like once a month (maybe) and that helps a lot! Thanks for the tips! Your hair looks beautiful! I have super fine thin hair and it seems like if I dont wash it everyday it gets super greasy by the next day! Thank you! But definitely TRY going every other day if you can, and just use dry shampoo! I seem to love all your suggestions! This is probably my 3rd big change I’ve made. Started Stitch Fix and I can’t wait until my next delivery… tried Larabar and don’t think I’ll ever buy another bar I like them so much. Thanks for all the great insight!! This is amazing stuff for hair growth and NATURAL. Thank you for the kind words about my suggestions! So happy I can introduce you to my favorites. I LOVED THIS POST & I really needed it today! Going to give this product a shot. You say don’t wash your hair every day but what do you do if you’re working out every day? I sweat a lot and my hair gets super greasy at the roots. Sadly my ends are super dry and I have really curly hair too! I’m a little different when it comes to hair because my hair hardly gets greasy (maybe on the third day) but I don’t sweat a lot! My friends think I’m an alien because we will run miles on miles and I will sweat a little AFTER the workout is done. It’s very strange. BUT if you can, maybe use dry shampoo or try to only wash the scalp of you hair and not the ends. When you say your hair is think but your strands are fine — do you mean you have A LOT of hair but each strand if fine? I ask because that’s my issue. YES! I have VERY THICK hair ( a lot of strands) but the strands are fine. It is possible. I really do not sweat that much (lucky) and If I do, I’ll rinse my scalp and avoid the needs. I usually just wrap my hair up and shower so it doesn’t get wet. Dry shampoo can help as well. I’m confused. You said you cut your hair all one length but then said you got layers…..? I cut my hair one length two years ago. I got an inch cut off every month for the past year so it would grow healthy before getting layers. To keep my hair healthy, I let it air dry as much as possible, use a shampoo and conditioner that has no harsh chemicals (Natures Gate) and wash it every other day, and rub coconut oil into the scalp and ends 1-2x’s a week. I use the coconut oil as my daily skin moisturizer as wellso I buy the bulk jars ? from Costco. I am going to look into Pura d’or! Love how much work you put into your hair ! :) RESPECT. I wash my hair every other night and let it air dry. Then in the morning I straighten it. Less heat damage. It’s made a huge difference. I also use coconut oil to condition twice a month. Sounds like you have a great routine! I actually want to do something drastic with my hair and get a boy cut, but I’m scared because if they screw up there’s no going back! Either that or I’ll dip dye mine mermaid style purple or blue. WRONG! 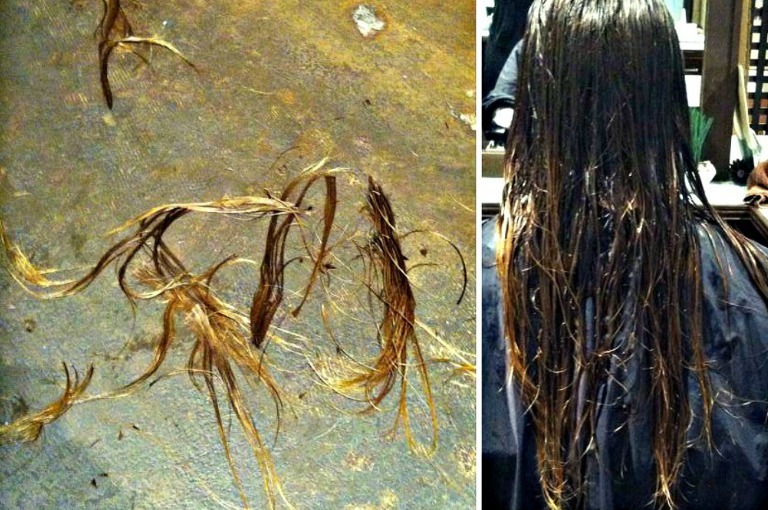 there is going back…because it’s just hair and it grows back! 🙂 You should totally do something fun!! I rarely use heat on my hair because I know how damaging it can be. Recently, I’ve been straightening my hair a lot more and I’ve noticed a huge difference in the health of my hair. I went from going months without any heat to using it three times a week and it’s taking a toll on my ends! I’m going back to no-heat! My natural waves are going to have to do! I notice the same thing when I start styling my hair and i’m so happy summer is back soon because NATURAL HAIR HERE I COME! Your hair looks so pretty and healthy! I’ve never heard of that brand before. Me either until I was introduced and now i’m hooked ! I will be doing a post with some of my favorite products soon 🙂 Definitely check into Pura D’or! To keep mine healthy, I don’t use the hair dryer more than maybe once a month. I wash them twice a week (I’m lucky, they keep looking good during 3-4 days!). 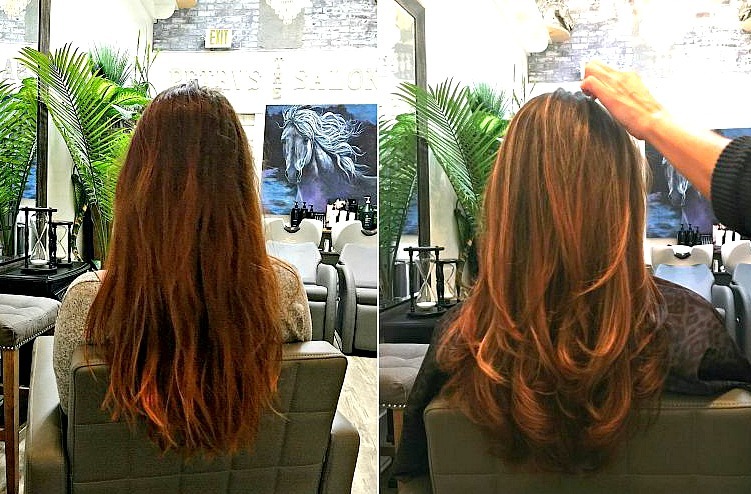 This made a huge difference (with the use of sulfate-free shampoo)! Lol, you and I sound like hair twins. Your hair has always been my favorite! Thank you for doing a blog on it. Love this product! I have been using it for like three months and truly makes a difference. I live by not washing my hair everyday! I only wash it once every two-three nights and it’s done my hair a world of good. Seriously the best thing ever for your hair! & good product when you do wash it! Your hair looks beautiful and so healthy! I try not to use heat much at all. I’m also working on not washing it every day, but I feel like it gets greasy if I don’t. Do you have any good dry shampoo brands that you recommend? Hope your Tuesday is fabulous! I have good months and bad months! I’m very fortunate when it comes to not having greasy hair until day three (and thats when I wash it) but it’s hard because I workout A LOT! I will do a post with some of my favorite products this friday! xo & i hope you have an amazing week! Loved this post! Your hair looks amazing.